That’s why we need you to contribute to this project! Waltham has changed a good deal since the last big photo collection was shared in the form of that priceless book Waltham Rediscovered. It’s time to take another snapshot of the city, adding the history we’re making now to the stories of Waltham roots reaching back generations. Become a part of Massachusetts history by sharing photos and stories with a state-wide archive of local history that will be available at the Library, the Historical Society, and online for generations to come. Take some time to go through your family photo albums and scrapbooks. Pick out two or three photographs that are important to you and best represent yourself, your family or your community. Photos can be old or new; formal or snapshots; color or black-and-white. They can be photos of you, your children or your ancestors. They can be photos of weddings, family reunions, military service or holiday gatherings. They can be photos of town functions, sporting events, businesses, clubs, or everyday activities. Original, unframed photos are best; as are photos in which you can identify the people pictured. 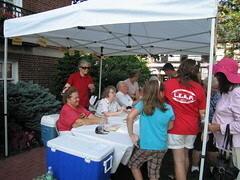 Saturday, July 16 any time between 10:00 am – 3:00 pm. Photos will be scanned and returned to you immediately. Do you live, work, or study in Waltham? See you on the 16th! Ice Cream = Shir Madness! 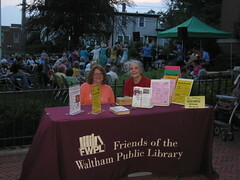 The Friends of the Library served over 300 cups of ice cream last night, while the crowd listened and danced to the Shir Madness klezmer band. 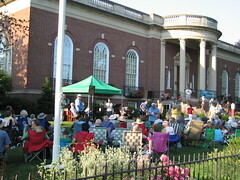 Just another free program brought to you by the Friends of the Waltham Public Library! Some work while others dance!